The Trustees are the unpaid guardians of the Town Hall Organ. They work with groups and individuals such as the Auckland Philharmonia Orchestra, the Choral Federation of New Zealand, organ students and touring organists from around the world, to ensure the organ is promoted and heard regularly. The Auckland Town Hall Organ Trust Deed states that the Council recognises the musical, aesthetic and heritage value of the organ and the need for its management and care, as well as its use. The Deed also sets out the objectives of the Trust that include the presentation of free concerts to the public each year, a stipulation of former Auckland mayor Henry Brett, who gave the entire amount required to build the original organ in 1911. New Zealand Charities Services. Our registration number is CC30369. have also been elected as Foundation Members of the Trust. Kevin Bishop is the general manager of Selwyn Heights, a retirement village. With wide-ranging experience in management accounting and business advisory services, over the years he has worked in many organisations including private education and large corporates and small business enterprises. His involvement in arts groups has ranged from advisory work to the development and general management of choirs and instrumental ensembles. His academic background includes demography and educational psychology with master’s studies in music and business management. Kerry Stevens had a forty-five year career in radio and television, ending with fifteen years as executive producer for Radio New Zealand Concert in Auckland. He studied piano and organ, designed a number of organs, and even built his own. Desley Simpson has a long family association with the Town Hall organ. 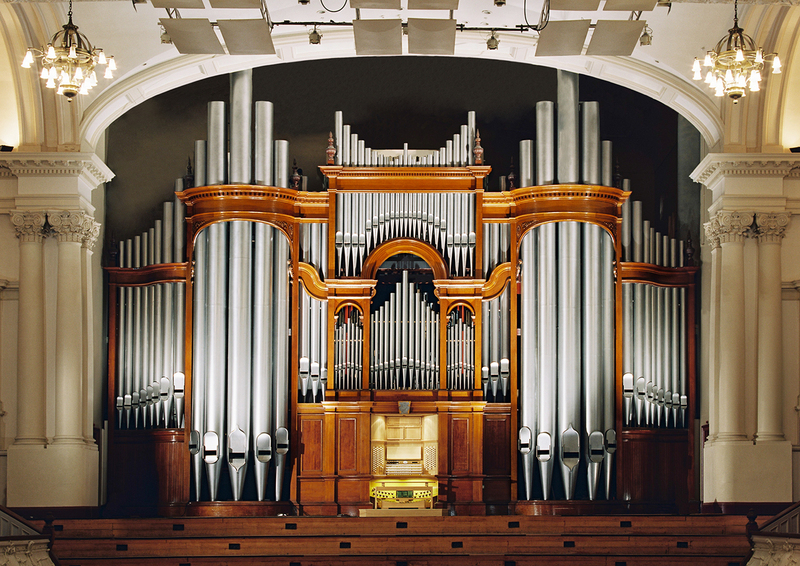 The first organ installed at the Auckland Town Hall in 1912 was donated by her great-great grandfather Sir Henry Brett – mayor of Auckland in 1878. He also secured the appointment of a city organist. She is a Justice of the Peace, very active in the local community and an organist. Desley is a Councillor for Auckland – Orākei Ward, and is the council representative on the Trust. Matt Pestle is a self-employed IT consultant. A keen amateur musician, Matt studies piano with Rosemary Barnes, sings occasionally in choirs and enjoys dabbling with software organs. His latest organ project converted the retired 3-manual console from St Matthew-in-the-City into a software practice organ. Tim McWhannell has been an organist since the age of 15. In the 1980’s he played three Sunday afternoon concerts on the Croft Organ in Auckland Town Hall and from 1994 to 1999 was organist of St Matthew-in-the-City. He is currently chair of the Music Events Group at St Matthew’s, a committee which organises and promotes concerts within the iconic building and cultural hub in central Auckland. Derek Firth MNZM is a commercial barrister practising mainly in the fields of construction law and project advice. He is an arbitrator and adjudicator. He is a former Chair of the Dilworth Trust Board and a former trustee of the NZSAS Trust. He is currently a trustee of the Melanesian Mission Trust Board and the HE Fairey Trust for disabled children. He chairs a group of six Australian companies (in the resource and energy area), the holding company and two subsidiaries of which are unlisted public companies. He has been a church organist since 1960. John Sinclair is an Auckland architect who has been involved in projects throughout New Zealand, the Pacific and Asia. He is a past President of the New Zealand Institute of Architects, former v President Oceania of the Commonwealth Association of Architects and has represented New Zealand in a number of international forums. He has served as a member of Chamber Music New Zealand Board, The Auckland War Memorial Trust, New Zealand Academic Qualifications Authority, Musica Sacra, Auckland YMCA Board and Holy Trinity Cathedral Council.